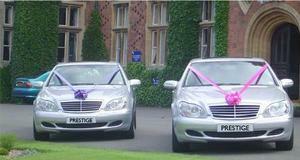 Prestige Chauffeur Services ~ Executive travel & Airport Transfer Services, Midlands. Prestige Chauffeur Services are based in Birmingham and provide Executive Chauffeur driven vehicles throughout the Midlands. Also serving Birmingham and East Midlands airports with our airport transfer service. So when you require any chauffeur services, Prestige will ensure your journey is relaxing and you arrive on time. ...so to make that special day even more memorable let our fantastically appointed carriges and chauffeurs whisk you to and from your nuptials and on to the honeymoon flight. With a choice of vehicles available you can have your favorite form of transportation to get you to the church on time. Whatever your requirements just contact our customer service team we will be happy to discuss your requests. We run nothing older than 3 years all vehicles tracked from Mercedes E & S long Mercedes Viano's, BMW 5 & 7 long Mercedes Sprinter 8 & 16 seaters all vehicles have WIFI when required. A Worcestershire-based company that offers VIP chauffeur service and a fleet of luxury vehicles suitable to business and corporate travel.